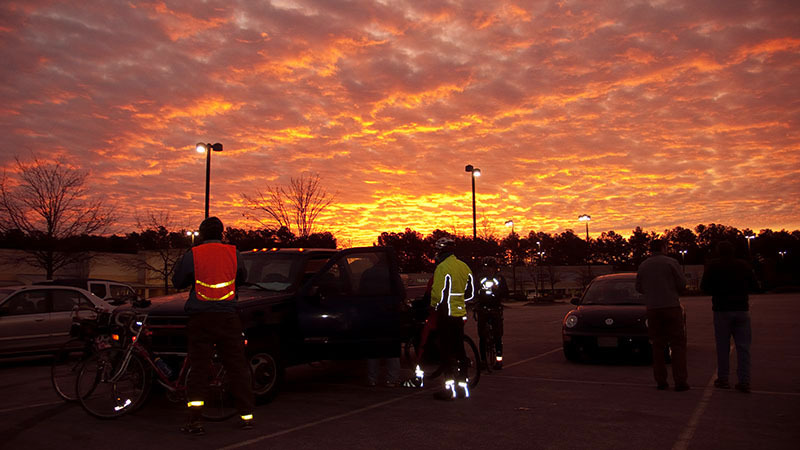 With a forecast for temperatures in the 20's at the start and a high of 40, Saturday's Bicycle for Life 300K was looking like another epic ride. I drove down to Lumberton early in the morning, swathed in wool and ready for a long day in the saddle. There was a good sized group of riders at the start, mostly riding the 200K, but I knew that Tim was there for the 300K and I was hoping to stick with him all day to help deal with the wind. Joel, Tom, and Ian were there for the 400K- more power to 'em! 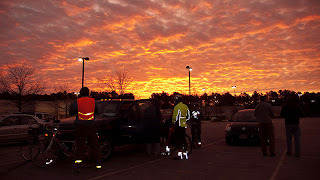 We all got signed in and ready to go and were treated to a gorgeous sunrise to start the day. Everybody stayed together for the first few miles at a literal warm-up pace, but as the speed picked up a bit the groups separated. Tom F. got on the front and did a 30 mile pull all the way to the first controle at Ammon, and I had a good time catching up with John P. and meeting his friend Eli from Asheville. At one point I pulled out my point & shoot to take a video of the group. I got out of line and moved up the left side to get to the front and just when I got there I noticed we'd hit the county line! I think we're going to need a photo finish to see whether Tom or I got the sprint points. Too bad that first controle wasn't a stop for the 400Kers, and we bid Tom and Ian "bonne route!" as they continued on down the road. Short stops are best on cold days, so I took care of my controle to-do list quickly and was ready to get moving again. The next leg of the 300K to the 2nd controle was 68 miles, and I had two extra water bottles along to handle that long stretch. Tim and I soft pedaled for the first bit but soon were joined by a couple of guys on the 200K whose names I've forgotten (sorry!) and Mary and Lee Ann who were also riding the 300K. Tim got on the front and the pace picked up. Soon we were cranking along at 20+mph and making good time. Here's where I always run into problems on brevets- I either have to struggle and push myself to stay with these fast groups or let them go and ride at my own pace in the wind. I knew my speed would drop to 16 or 17mph if I let them go, so I hung on as long as I could. After 30 or so miles I started yo-yoing a bit off the back, any speed fluctuation seemed to cause me to gap off and the effort it took to close those gaps was taking its toll. Tim put in one of his signature extra long pulls, and when he got off the front the guy behind him dropped the hammer. I was doing 24mph and there was still a gap opening! When they finally calmed down a bit I caught the group again, but I was spent. There was still 25 miles or so to the next controle, but I told Tim it was good riding with him and the next time a little gap opened up I just stayed within my rhythm and watched them go. I still had them in sight for awhile, and I was doing a comfortable 17-18mph pace. I had resigned myself to a solo ride to the next controle at Shallotte, but when I made the turn onto NC-130 I spotted Tim stopped at the store. He'll tell you that he had to adjust the chemical warmers in his shoes, but I'm pretty sure he was also waiting to give me a helping hand over the next 20 miles to Shallotte. Randos value self-sufficiency, but I sure was glad to see him! We were hoping to get to the controle while Mary and Lee Ann were still there and group up again. We'd enjoyed a tailwind as we headed south, but after Shallotte we'd be fighting the wind. At the controle there was no sign of Mary and Lee Ann, so we got our cards signed and decided to go to the Wendy's next door for a much needed sit-down break. As we were leaving the store Mary and Lee Ann showed up! They had stopped at a store somewhere along the route and we didn't see them as we passed. They joined us at Wendy's and we all discussed techniques for staying warm out there! The four of us made the short 12 mile trek to Sunset beach, climbed the bridge and stopped at the pier. Here in the off-season the pier was closed, so we were unsure where we were supposed to get our cards signed. We took a picture and headed back out on the road looking for an open shop. At an open realty firm I finally looked at the brevet card and saw that Tony had made the pier an information controle! I rode back to the pier to count the porta-johns and met up with a couple other 300K'ers. Back at the realty firm I told Tim, Mary, and Lee Ann to go on without me- the pace they were able to maintain had been hard for me, and I thought that I should group up with the other riders and share the work. They said we should all group up, so we waited for a bit but standing around waiting makes you get cold. We went ahead and got back on the road, intending to soft-pedal and let everybody group up. I got dropped on the climb back over the bridge, so it wasn't long before Tim and the ladies were out of sight. I soft-pedaled and let Doug catch me and we rode together for awhile, at one point we passed a store where Mary and Lee Ann had stopped. We kept going, figuring that they would catch us (which they did.) The four of us rode together the rest of the way into Nakina, only catching up to Tim right when we got to the controle. This pace was much slower than before, mainly because of the quartering headwind. Even though I was glad we weren't cranking along at breakneck speeds I felt like this pace was just too slow. I wasn't working hard enough. That's one of the catch-22s of cold weather cycling- you need to work hard enough on the bike to keep your heart rate up, keep that blood flowing to the extremities, and stay warm. Initially it feels colder to go faster because of the wind, but the extra work is what keeps you warm. Perhaps riding solo in cold weather is in some ways better, I guess everyone has a different optimal exertion level and if the group is going too slow you cool down. Too fast and you get drenched in sweat! After a nice stop at Nakina we all got back on the road together and the pace started to pick up again. Darkness had descended and the temperature was going down quickly. My battery lights were much dimmer than my riding partner's, and when one of them was behind me I had trouble seeing the road directly ahead. Their bright beams threw a dark shadow of me and my bike and my lights weren't powerful enough to illuminate the shadows. Hopefully this was my last night ride without a dynamo light- it should be here in time for the 400K. When we rolled into the controle at Whiteville we were met by Tony with a thermos of hot coffee, exactly what we needed just then. Thanks Tony!! 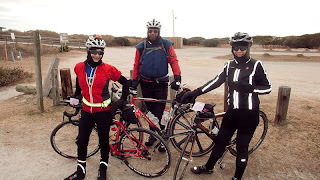 We got back on the road and by this time I had recovered a bit from my earlier fatigue, and was able to keep up with Mary, Tim, and Lee Ann. I was even doing turns on the front, albeit mine were shorter than everybody else's. The temperature had dropped to around 22 degrees and we were all experiencing numbness in our fingers and toes. It becomes a self-perpetuating problem, your numb toes make you want to pedal slower and then you're not working hard enough to keep the core temperature up. I saw Tim falling back, then closing the gap, then falling back again. Once I figured out what he was doing I started doing the same- out of the saddle sprints to warm up! That got me to the finish, and we all went over to the Waffle House and scarfed down some hot food. All in all it was another epic ride, and I finished it off by driving an hour and a half to get home instead of getting a hotel room. I was pretty tired, and in hindsight driving home was probably not the brightest idea. Still, I made it home safely and crawled into my warm bed for some much needed sleep. Nice write-up and congrats to you and the rest.